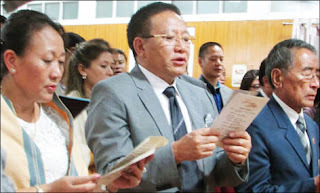 Bowing to the opponents of reservation for women in urban local bodies, Nagaland chief minister T R Zeliang resigned from office late on Sunday and called an emergency meeting of the ruling Naga People's Front on Monday to select his successor. Two major anti-reservation groups, the Nagaland Tribes' Action Committee and the Joint Coordination Committee, have been carrying out a relentless campaign for Zeliang's sacking since the death of two people in police firing during a protest Dimapur on January 31. On Saturday night, 49 legislators, including the 39 who had earlier supported Lieziestu, agreed “in principle“ to back NPF Lok Sabha member Neiphiu Rio as the next CM when the latter met them at a resort at Assam's Kaziranga National Park.